Just as in the blind man and the elephant parable, we must be willing to accept that our truths might only be part of the whole picture. Not only do we find this in so many areas of our individual lives but it’s evident in the collective human experience as well. Which means truths are dynamic and flexible, ever changing and molding to their environment, just like water. This also means that something as simple as a change of perspective can change your truth. Not only do I think this ok, I say it’s good for us and necessary for growth. 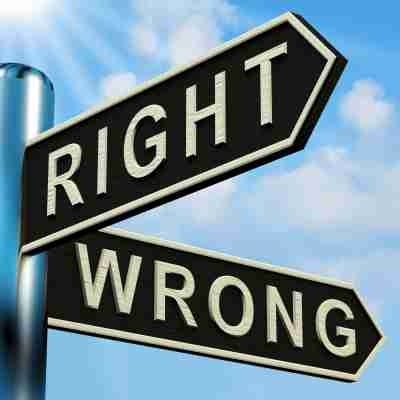 Being wrong means we get to explore different paths. So many of us are stuck in our ruts, following the same small trails, never quite seeing all the possibility that exists around us. Finding out we were wrong gives us a reason to change course and explore a different direction. Finding out we are wrong frees us from the chains of our own mind and lets us see new things. So let’s see what happens when we don’t see being wrong about something as bad thing and instead as an opportunity to wander into new realms we wouldn’t have entered before. Let’s be wrong about stuff and be glad. P.S. That’s one of my goals: to prove myself wrong constantly. If I don’t challenge my truths I’ll never find if they’re no more than just my convenient beliefs. Next Are Your Genes Your Destiny?